The common snook, also known as the sergeant or robalo fish, is an inshore saltwater fish that is found in the brackish and coastal waters of mid to southern Florida. They follow an annual cycle of following the mullet run out to the beaches in the summer. As the Fall and Winter months roll in, they move into rivers, passes and backcountry, where they will remain through the colder temperatures. Snook are very sensitive to cold and may perish in water that is below 60 degrees. A major freeze a few years ago killed off a large population of snook and the FWC decided to close the snook season for several years to catch and release only to enable the population to revive. That being said, please pay attention to the posted snook regulations and practice catch and release. The snook like to position themselves near cover facing moving tidal current which will bring the bait fish right to them. Look for areas near mangroves, fishing pier pylons, seawalls, sunken trees, any type of cover that the snook may hide behind to allow them to be in position to pounce on their unsuspecting prey. High tide or low tide, it usually will not make a big difference, as long as the water is moving. Just watch the movement of the water and look for the cover. After a while, you will be able to figure it out. Saltwater & Freshwater Green Underwater Dock and Fish Attracting Light Kit. Long 50′ Lamp Cord. The best bait for snook include pilchards, herring, and sardines which you can usually catch with a cast net. You can also use live pinfish or grunts which you can catch yourself with a small hook setup or a sabiki rig, or simply buy some live shrimp. Snook fishing tackle would include a medium rod spinning reel combo with about 15 -20 lb test monofilament line attached to a 2/0 circle hook. Optional set up would be to add about 24″ of 30 lb test fluorocarbon leader between the mono line and the hook, but that’s your choice. This simple rig will work, but you should check the condition of the line close to the hook frequently as it can become chafed and that section will need to be removed and the hook re-tied to the mono line. There are many knots to choose from, but the palomar knot is a simple reliable knot that is our go to knot. 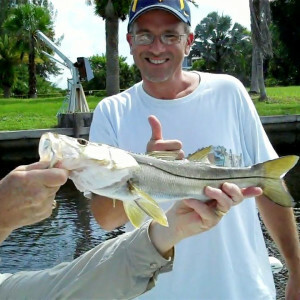 When trying to determine the best snook lures to use, you want to find something that resembles that baitfish that the snook are feeding on in the area. In addition to the artificial lure looking like the bait, the action must also be the same the way in moves through the water on the retrieve. Some lures are designed for top water, some are suspended to move just under the water. Others may bounce off the bottom like a jig. Pay attention, and understand how the lure works before attempting to use it. Once you have the hang of it, then you can experiment with different speeds or techniques to see what works better. Below is a list of a few of the more popular snook fishing lures. Catching snook requires patience and perseverance, as well as understanding the tendencies of the snook. We know that they like to position themselves facing the tide flow behind cover waiting for baitfish to come through so that they can punch on them. They really do not like to use any extra energy, they get into position and wait. So, once you have found a snook spot, it’s more than likely that during that same tide cycle, it’s going to be occupied again by another snook, so make a mental note of that location. 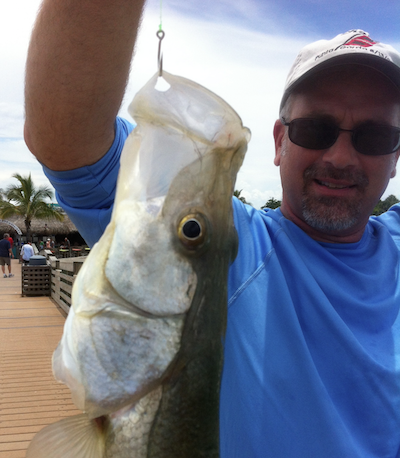 Snook are certainly fun to catch and they will put on a show once they are hooked. They can tolerate brackish water and can sometimes be found in freshwater. Live baits are your first choice, but artificials can also be productive. The best way to learn how to catch a snook or any type of fish is to get out there and do it. You will learn things along the way. You will find out techniques that work better than others, or times of day that produce better results. The key is to learn the basics of snook fishing and then get started. If you want to step up your snook game fast, check out Snook Samurai.